Before you begin, make sure all of your windows and doors are tightly closed so that you don’t get any water or cleaning solution inside your home. Secure an attachment to your hose that gives you a straight stream of pressurized water (such as the “jet” setting or “flat” setting). Next, set up your ladder (if needed) and spray down your siding from top to bottom. Take your time rinsing off your siding to remove as much dirt and debris as possible. After you’ve washed down your siding, prepare your cleaning mixture. In a large bucket, mix your mild detergent with water to create a soapy wash.
Place your ladder at one end of your siding and using a ladder hook, attach your bucket to your ladder. Starting at the top, use your soft brush and soap mixture to gently clean your siding. To make the process go a little quicker, have someone get your hose ready and rinse off the soap once you’ve covered a large area. If you discover any mildew along the way, mix together one part bleach and four parts water and spray the solution onto the area. Rinse your entire siding area clean and you’re done! 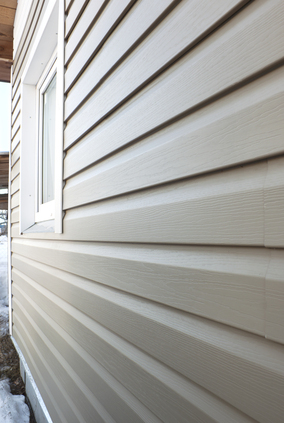 If you’re interested in siding that is low maintenance, resists rot, and is available in a wide variety of colors, consider vinyl siding from P.J. Fitzpatrick. We can replace your aluminum siding quickly to give you beautiful, durable siding that stands up to the elements.